How to check whether you have a safe Galaxy Note 7 battery? How to know whether your Galaxy Note 7 battery is safe or not? This guide shows you 3 different methods to check whether you get a safe Galaxy Note 7 battery: IMEI number, battery icon in status bar and always-on display, and power button options. Following the global Galaxy Note 7 recall, in the market, there are two types of Galaxy Note 7 devices: Galaxy Note 7 to be returned (but the owners have not done so) and the safe Galaxy Note 7 devices (with a safe Galaxy Note 7 battery). For your own safety, you should make sure your Galaxy Note 7 now has a safe battery inside. If the battery is not safe, you should return the phone to local Samsung office. Do not risk your safety. This guide shows you various methods to check whether you have a safe Galaxy Note 7 battery in your Note7. You can use the IMEI number (which is unique for each mobile device) of your Galaxy Note 7 to check whether the Galaxy Note 7 battery is safe or not. For dual SIM models, there are two IMEI number. Normally, you just use the IMEI number for SIM card slot 1. Outside Galaxy Note 7 box. Outside of the box, the IMEI number usually is usually printed in a white label. Inside Galaxy Note 7 box. Inside the Galaxy Note 7 box, there are some sticks. Some of them are for IMEI numbers. Back of Galaxy Note 7 device. IMEI number is always printed in the back of your Galaxy Note 7 near the main antenna area. You can find the tiny characters under CE0168 or something similar. Anyway, the characters are always small! The IMEI number is sectioned by “/”. You need the whole string, then remove the “/”. In Galaxy Note 7. In your Galaxy Note 7, you can find IMEI number in Settings — About device — Status — IMEI information. You can use any of the above-mentioned 4 methods to get the Galaxy Note 7 IMEI number. If you are not sure, you can always visit local Samsung service center or carrier’s store to get the IMEI number. 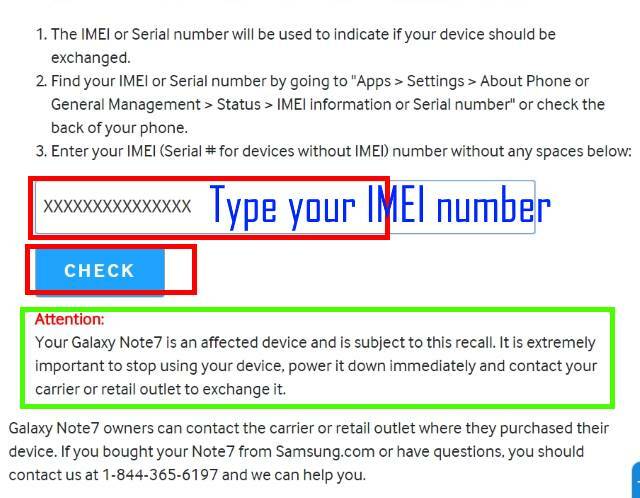 Once you have the IMEI number, you can check whether the Galaxy Note 7 battery is safe or not at: http://www.samsung.com/us/note7recall/ in the eligibility section as shown below. If your Galaxy Note 7 battery is not safe and you will get the following message as shown below. Your Galaxy Note7 is an affected device and is subject to this recall. It is extremely important to stop using your device, power it down immediately and contact your carrier or retail outlet to exchange it. If your Galaxy Note 7 have a safe battery, you will get the following message as shown below. You can charge Galaxy Note 7 battery and use the phone normally. Using a Galaxy Note 7 with a unsafe battery may pose risks to you and others around you. Although most accidents happened when charging, it is possible for Galaxy Note 7 to catch fire when you are using it. In late September, Samsung rolled out a software update for all Galaxy Note 7 devices. This udpate includes Android monthly security patch (September), a new battery icon(green) and a power button options for Galaxy Note 7 devices with a safe Galaxy Note 7 battery. You may get the software notification as shown below. You may notice that the color of battery icon is white as shown below before the update. To install the app immediately, tap Install now as shown below. Alternatively, you can install it later. In some regions, this update may be pre-installed already. After installing the udpate, you will notice the battery icon changed to green as shown below if your Galaxy Note 7 battery is safe. If you have a unsafe Galaxy Note 7 battery, the icon will still be white (as shown above). In addition, you can only charge the battery up to 60% of the capacity. Please note, green battery icon will also be shown in the always on display (AOD) if your Galaxy Note 7 has a safe battery as shown below. Of course, if you don’t have a safe Galaxy Note 7 battery, the battery icon will be in white. As mentioned, after you installed the update, you will get additional Power button option as shown below. You can hold power key for 2-5 seconds to get the power button options. If your Galaxy Note 7 has a safe battery, you will see this additional battery button. What should you do if your Galaxy Note 7 battery is unsafe? You should back up your data and replace your Galaxy Note 7 as early as possible. It is recommended to power off the Galaxy Note 7 until you replace or return it. Can you check whether you have a safe Galaxy Note 7 battery now? If you have any questions on whether your Galaxy Note 7 battery is safe or not, please let us know in the comment box below. You can get the official Samsung Galaxy Note 7 user manual (user guide) in your local language in Galaxy Note 7 user manuals page. For other detailed Galaxy S7 how-to guides, please check Galaxy Note 7 guides page. Great info and sometimes the battery of other phones causes much problems too!